EVERETT, Wash., March 16, 2012 – Team USA, led by all-around winner Jordyn Wieber of DeWitt, Mich./Gedderts' Twistars USA, dominated the competition Friday night at the 2012 Kellogg's Pacific Rim Championships inside Comcast Arena at Everett. Team USA stormed to the lead after posting a 60.700 on vault and never looked back, topping the final standings, 239.700 to China's 220.650. Canada picked up the bronze medal with a 219.000 total. Wieber posted the night's highest total in the all-around, a 61.050, followed by Kyla Ross of Aliso Viejo, Calif./Gym-Max, (59.200), and Christine Lee of Canada, who posted a 57.800. 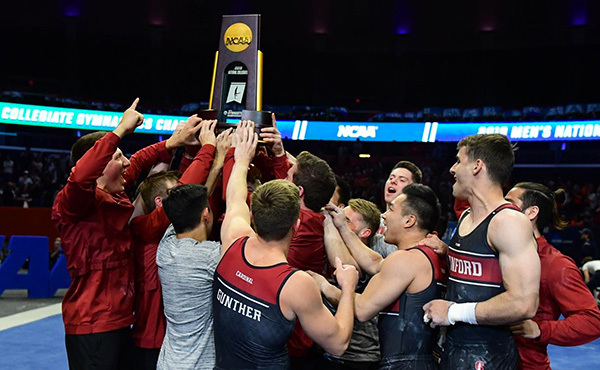 Competition from the 2012 Kellogg's Pacific Rim Championships continues tomorrow, starting at 1:30 p.m. PT, with the first of two subdivisions for the men's team and all-around competition. 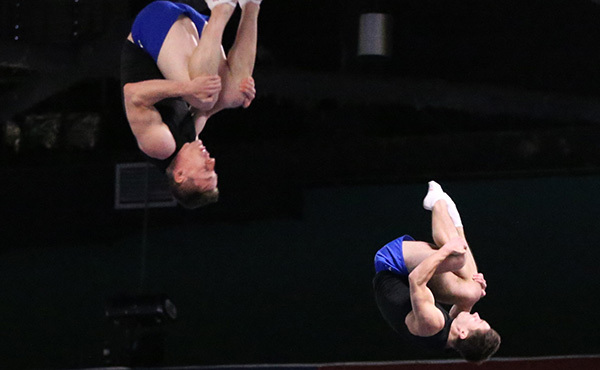 The U.S. team competes in the second subdivision, which begins at 7 p.m. PT. "It felt great to win today," said Wieber. "First and foremost, I wanted to help the team as much as I could. 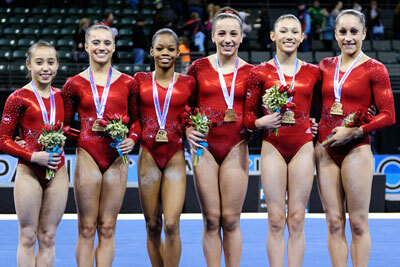 To come out with a team gold and all-around gold was just amazing." Ross added, "I'm so happy with how today went, winning the gold medal with Team USA was amazing." In the junior competition, Katelyn Ohashi of Plano, Texas/WOGA, too the all-around title with a 60.000 total score. "I was glad I went four-for-four," said Ohashi. "Competing with Team USA in my hometown was a dream come true." Lexie Priessman of Cincinnati, Ohio/Cincinnati Gymnastics, 57.800, and Amelia Hundley of Cincinnati, Ohio/Cincinnati Gymnastics, 57.600, completed Team USA's 1-2-3 finish in the junior all-around standings. Hundley was not eligible for awards since there is a two per country rule in the all-around competition. "It feels great to win the team gold medal," Priessman said. "Knowing that we're up there with everyone cheering for us was a great feeling and honor to be out there." The U.S. team took to the floor exercise in the final rotation knowing they could not be caught – and put on a show for the more than 7,500 fans on hand. Ohashi mounted with a back one-and-a-half to front double full to start the Americans off with a 14.650. Priessman followed with an energetic routine that mounted with a double twisting, double back to score 14.000. Ross, performing to music from "Phantom of the Opera," captivated the crowd and added a 14.100. Wieber, drawing huge cheers for her stuck double double mount, earned a 14.650. 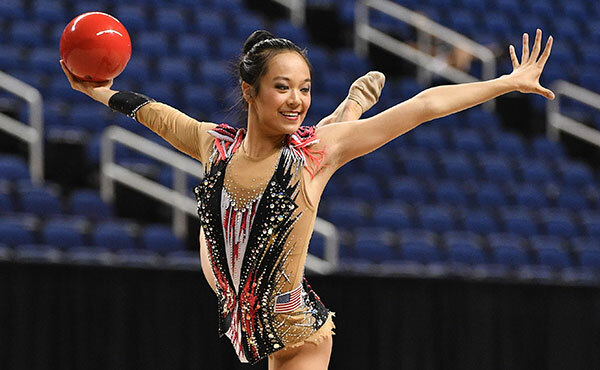 Hundley closed out Team USA's efforts with a 14.450, cementing the American's more than 19-point win over second place China. Team USA began competition on the vault with Ohashi in the leadoff position, posting a 14.850 for a double twisting Yurchenko. Then, Priessman, Ross and Wieber all performed two-and-a-half twisting Yurchenkos, earning 15.300, 14.850 and 15.700, respectively. In rotation two, the Americans moved to the uneven bars, where they earned a 60.400 total. 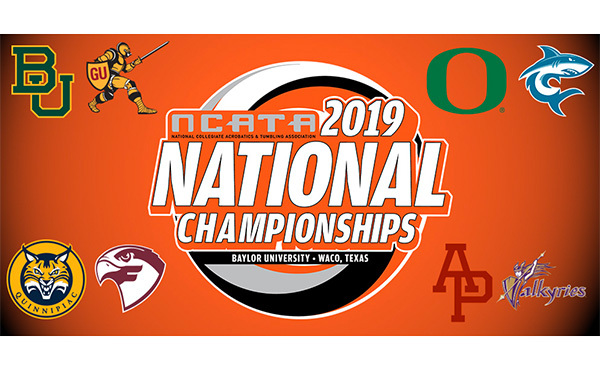 Gabrielle Douglas of Virginia Beach, Va./Chow's Gymnastics and Dance, posted the highest score on the event for day one, a 15.500, delighting the crowd as she flew high above the bar on her piked and straddled Tkatchevs. Ross, debuting a toe-on Shaposhnikova-half, added 15.250, and Wieber stuck her double layout dismount for a 15.000. On the balance beam, five of the six U.S. competitors performed back flips with full twists and totaled 60.400. Hundley lead the team off, scoring 14.200. Ross earned 15.000 on the event, performing a switch ring leap and double tuck dismount. Ohashi posted the highest score of the evening on any event, posting a 15.850, with her incredible difficulty, which included a standing Arabian to a back handspring and a flawless back handspring, back handspring, layout full twist series. 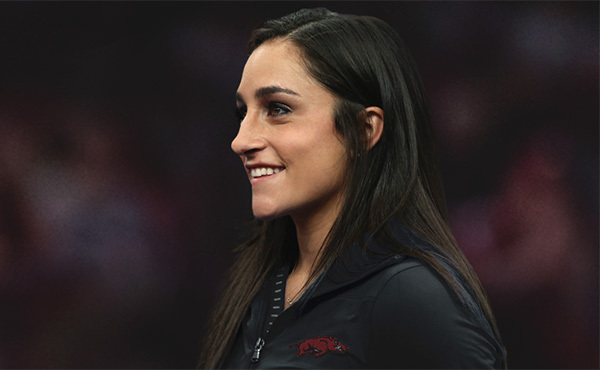 Wieber followed with a 15.700, after nailing a front handspring to back full to back handspring combination and nearly sticking her two-and-half twist dismount. The U.S. women will be back in action on Sunday in the event finals. The American athletes who advanced to the finals are as follows. The competition schedule is as follows. Held every two years, the Pacific Rim Championships were held in Honolulu in 2004 and 2006; San Jose in 2008; and Melbourne, Australia, in 2010. In 2010, the USA won both the men's and women's team titles and three of the all-around titles - John Orozco of the Bronx, N.Y./U.S. 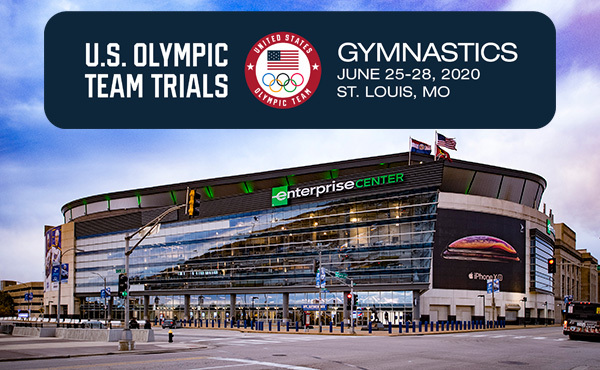 Olympic Training Center, junior men; Jordyn Wieber of DeWitt, Mich./Gedderts' Twistars USA, junior women ; and Rebecca Bross of Plano, Texas/WOGA, senior women. 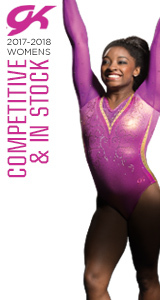 Past all-around champions include the USA's Paul Hamm, Carly Patterson, and Nastia Liukin. Kellogg Company. For more than 100 years, consumers have counted on Kellogg for great-tasting, high-quality and nutritious foods. Kellogg Company, with 2010 sales of more than $12 billion, is the world's leading producer of cereal and a leading producer of convenience foods, including cookies, crackers, toaster pastries, cereal bars, fruit-flavored snacks, frozen waffles and veggie foods. Kellogg Company's beloved brands, which are manufactured in 18 countries and marketed in more than 180 countries, include Kellogg's®, Keebler®, Pop-Tarts®, Eggo®, Cheez-It®, All-Bran®, Mini-Wheats®, Nutri-Grain®, Rice Krispies®, Special K®, Chips Deluxe®, Famous Amos®, Sandies®, Austin®, Club®, Murray®, Kashi®, Bear Naked®, Morningstar Farms®, Gardenburger® and Stretch Island®. For more information on the Kellogg Company, including our corporate responsibility initiatives, visit www.kelloggcompany.com.